The city of Dakhla is located in a contentious part of the world known most widely as the Western Sahara. There is a long standing disagreement as to whether it belongs to Morocco or should be an independent country. When I travel my goal is to support local populations economy and infrastructure. I do not have a political agenda. Our visit to Dakhla was paid out of pocket, and was not in any way sponsored by any company, government or organization. I recognize that there are people on both sides of this debate and I kindly ask that you refrain from sharing your political opinions in the comments of this post. Dakhla is a medium sized city of just over 100,000 people located 400 kilometers north of the Mauritanian border. The city is built on a peninsula that runs down from the mainland creating a lagoon area that is popular for kite surfing and wildlife. Unlike most of Morocco, this part of the Sahara was controlled by Spain for hundreds of years and has close ties to the Canary Islands. Dakhla was made the capital of the Spanish Sahara. The recent history and background of the region is complex. In the 1960’s and 70’s things started to get a little more tumultuous with pressure being laid on Spain to give up the territory by both Mauritania and Morocco. From 1975 it was considered jointly administered by the two countries though neither recognized each other leading to the Western Sahara War that lasted from 1975 – 1991 when a UN sponsored cease-fire went into effect. Much of the area now is under Moroccan control however there is an inland portion controlled by the Sahrawi Arab Democratic Republic, managed by the Polisario Front, a controversial third party actor. 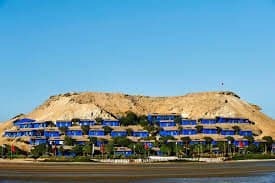 I realize that this might all sound a bit scary but if you’re visiting the city of Dakhla it’s quite safe and a great beach destination. There are not a lot of foreign visitors that come, aside from kite surfers, instead most tourism is Moroccans. 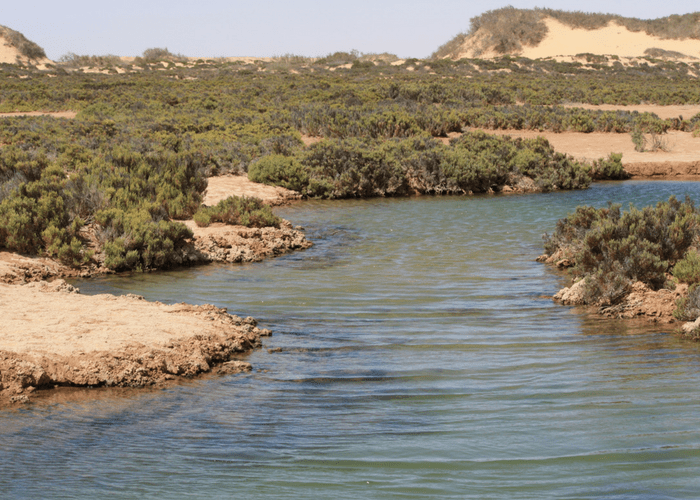 Dakhla has a temperate year-round climate so you won’t experience the extreme heat you will in other areas of the Sahara. One thing to keep in mind however is that it can be quite windy. If you have young children it might not be the best choice for a beach vacation however if you have active teens they’ll be thrilled with all the options. 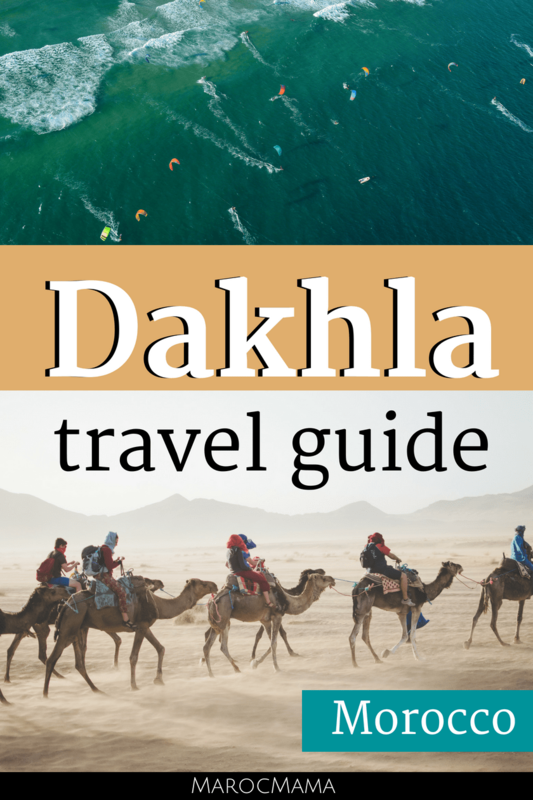 The number one question I was and have been asked since planning our trip was “is Dakhla safe?” There is a lot of information that is floating around about this. I can only speak from my own experience and in speaking with people who live in Dakhla. I NEVER felt unsafe or threatened. Many visitors choose to stick to the beach resorts which are small, isolated, self-contained communities. If you do go into the city of Dakhla you will find the people there to be incredibly kind and friendly. For women who are traveling and find other areas of Morocco to be a pain when it comes to street harassment Dakhla is a breath of fresh air. Never once was an inappropriate comment made to me, even when I was sitting alone outside. This is something I can say was truly different. Just like with all destinations, there are some areas that you should avoid. The inland areas controlled by the SADR are not advisable. Also, if you plan to travel to Mauritania you should be aware that travel in convoys is advised (and I’ve read accounts that it’s required) from points south of Dakhla to the border. If you plan to rent a car there is very limited GPS coverage – this is the Sahara and there are limited paved roads. Many routes are on dirt and are barely marked. More than once I shook my head wondering how anyone found their way. It is not a good idea to go driving off-road when you do not know your way as some areas in the territory are still mined. Reaching Dakhla there are limited options, given it is such a far distance. It also is one of the more expensive destinations to reach. 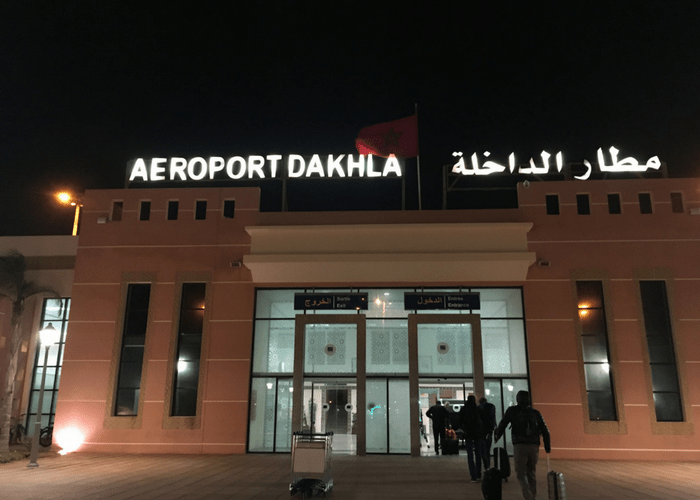 There are both domestic and international flights to Dakhla. Direct flights exist from Agadir and Casablanca and you can connect to these cities from other points in Morocco via Royal Air Maroc. These domestic flights are quite expensive, averaging around $200 a person roundtrip. International flights arrive from France and Germany and seasonally from the Canary Islands. The Dakhla airport is VERY small. It is one runway and one small terminal so you need not worry too much about getting lost or arriving too early for your flight. Bus service is available from major Moroccan cities to Dakhla via Supratours, CTM as well as cheaper option SATAS. Tickets are around 500 dirham and can not be purchased in advance. Keep in mind this is a very long journey. 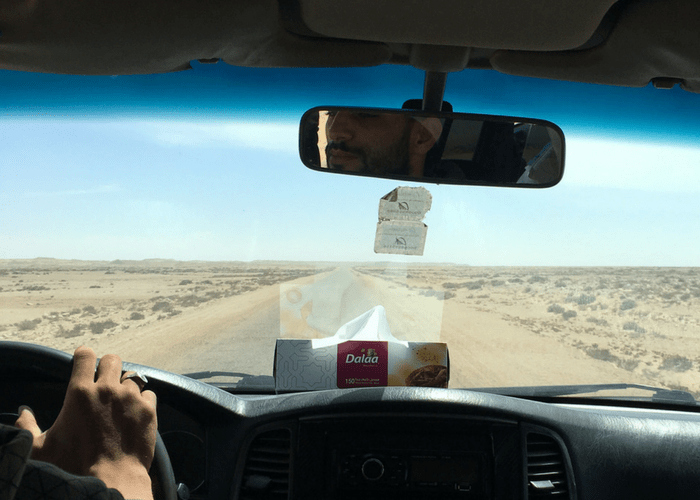 From Marrakech to Dakhla is about 1,400 kilometers and the bus journey takes 24+ hours. If you’re up for a roadtrip, this would be an epic one. It will take a minimum of two days for you to make the drive with a stop in the middle of the trip. It should also be expected that you’ll run into many police checks along the way so stick to the rules of the road and be prepared for this. You also should avoid driving at night as there are no lights and you may find yourself face to face with a camel crossing the road. 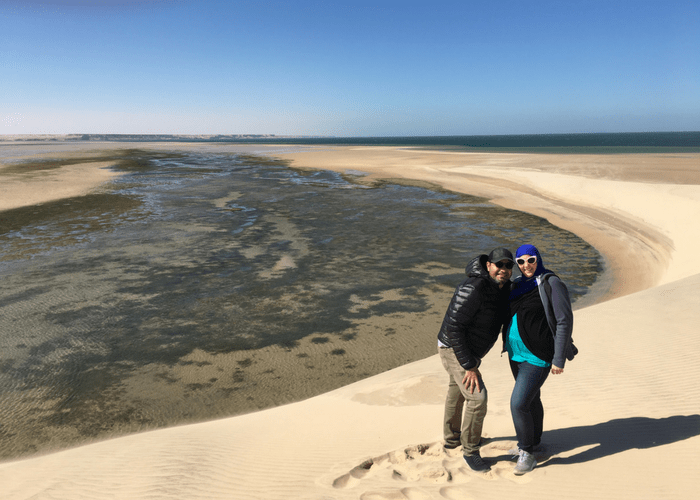 At first glance there didn’t seem to be a lot to do in Dakhla but in the end we ran out of time to see all that we wanted! This is the number one activity that people come to Dakhla for. There are dozens of hotels and resorts in the area that specialize as kite surf camps. There are also many other outfitters that just offer equipment and transportation to kite surfing spots. Whether you’re a beginner or advanced there really is something for everyone. If you plan to kite surf look into package deals that combine room, board and your equipment to save a little bit of money. For example an option we had was to do 8 hours of kite surfing lessons for 300€ or pay about 80€ an hour if we didn’t want the package. So I wasn’t sure about this but we were told we HAD to go see it. Essentially it’s a giant sand dune that is in the middle of a lagoon. When the tide goes out the water pulls back and there’s a giant open space of land. When the tide comes in it surrounds this dune but only goes up so far. A little strange, and pretty cool! This is a great spot to see migratory birds and when the tide is up we were told kite surfers use it as a jumping off point into the water. I could see how it would be fun to use it as a natural slide if the water were high enough! This might be one of the strangest things I’ve seen. About 100 km south of Dakhla is the Imlili Desert. Called sebkha’s there are 160 natural salt water pools that exist in the middle of this desert area. Not only that but there are small salt water fish that live in these water holes. Nearby there is also fresh water wells that attract herders and wild animals. It’s honestly very peculiar but incredibly interesting to see. The ocean is not too far away (perhaps 20km) and there are several very nice beaches if you want to visit before heading back to the city. If you can make it happen, this is an experience every visitor to the region should have. 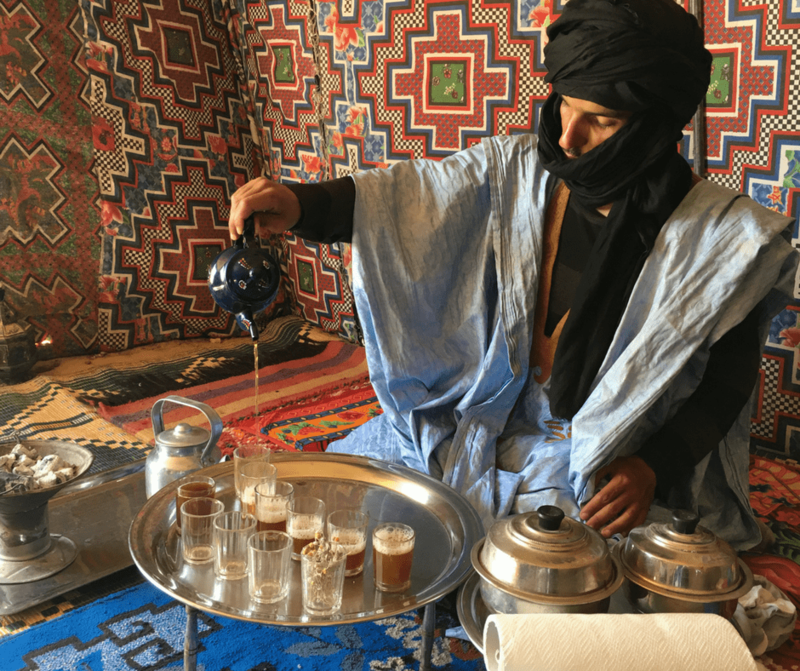 There is a very special way that Saharawi tea is made and drank. It includes a LOT of pouring and the drinking of 3-4 glasses of tea, each of which tastes differently. This was one of my favorite things we did because it truly is a cultural experience. Be prepared, this is a really long procedure; I estimate it took over an hour! In the city there is a small souk (in comparison to Marrakech) that you should visit. 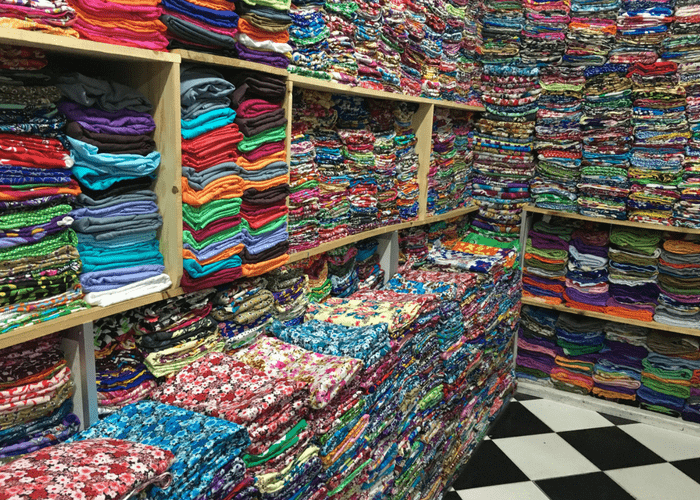 There are a lot of different things available for purchase here than you’ll find in other cities. A few of the things that I made sure to get were melhfa fabric (the lightweight wraps that women from the Sahara wear), Saharawi loose tea, acacia sap for sweetening tea, and el aych a type of grain/cereal commonly eaten here. I wish that we could have spent a lot longer! 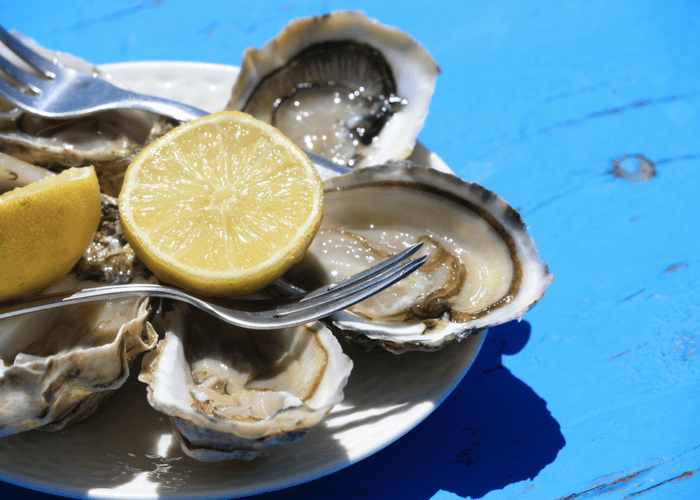 One of the biggest exports of the region are oysters headed mainly for Europe though local farmers are trying to get the Moroccan population more interested in this dish. The area makes good sense, the lagoon is a protected space making the water and the environment surrounding the oysters very clean. All of the harvesting happens by hand and a lot of care is taken to keep the oysters safe. 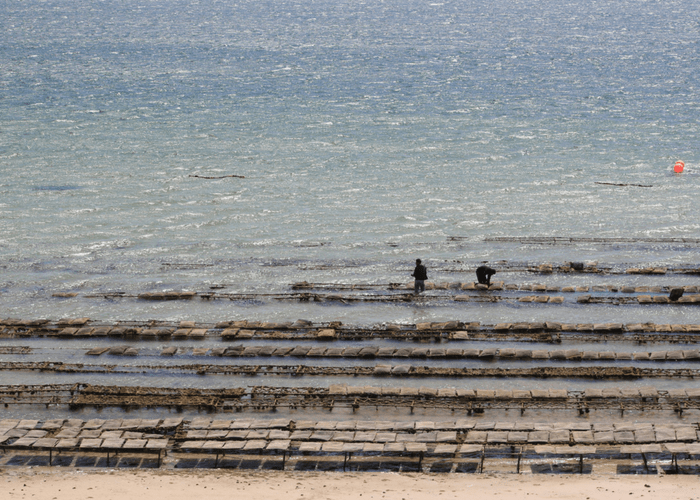 We visited in the morning and afternoon; in the morning we could see workers harvesting and checking on the oysters but by afternoon the tide had come up and they were completely submerged. While I’m sure this farm has a name, I’m not sure what it is! We visited briefly just to see these odd birds who are raised and either sent abroad alive or used for meat in high end restaurants. I wouldn’t say this makes for a long visit but at 10dh a person, and if you can catch it when it’s open (like many things it seems schedules are loosely held here) it’s worth a stop on your way into Dakhla. If you’re staying in one of the kite surf hotels chances are your stay will be all-inclusive. This is a good thing if you don’t have transportation in and out of town as it is quite the distance and there’s not really anything around most of the resorts. That being said, sometimes the food can get a little boring. In those cases here are a few suggestions for places we liked! This restaurant is open to outside guests if you make a reservation. It serves Asian food which might be a welcome sight if you’re getting tired of the same fare and the sushi is really good! This is a little restaurant in the city of Dakhla proper. Our driver brought us here for Friday couscous and it’s a local place to be sure. Everyone eating here was local! The owner and his wife were extremely active and it’s his Fassi wife that heads up the kitchen. Fridays are couscous days and other days they have specialities like r’fissa or b’stila! If we put in an order the day ahead they could have made us camel couscous but alas. Instead our driver headed down the street and got us a few skewers of grilled camel to have on the side. Very good, very real Moroccan food. This is the restaurant at the oyster farm.. You can choose from oysters either fresh or grilled as well as a variety of other seafood. Honestly, our favorite thing was the octopus tajine that was cooked well and not chewy at all. What’s available depends on the season – I just missed out on lobster. Raw oysters are just 4dh each and the tajine? 40dh. Very reasonable prices! Word of caution however, there’s no bathroom so be prepared! Misconceptions you may have about dining in this area is that they eat a lot of camel meat. Turns out they don’t. We found it quite hard to actually find camel anywhere even when we asked about it. Seems like down here the same is true as further up north, camels are worth a lot more alive than they are dead. This is one of the most popular kite surfing hotels in the area. While we considered staying here, we knew we probably wouldn’t be kitesurfing and it’s pretty heavy on the activity. There are two camps with three different types of accommodations and various budget levels making it a good choice to consider. Your stay is all-inclusive. This hotel has properties in Essaouira and Dakhla and is a really great spot to get away from it all. We tried to book this hotel first but they have a minimum 5 night stay and we were only staying for 4 nights. There is onsite massage, yoga, kitesurfing, and plenty of space to relax. The property is an ecolodge so they do their best to be as eco-friendly as possible. This is the hotel we chose to stay at. It is a newer hotel, opened for about one year. It has kite surfing as an option though this isn’t something we ended up doing. Overall we enjoyed our stay here. The price was ok (it is all inclusive) and we found the staff to be very outgoing, warm and welcoming. The food was also good though by day 4 I was getting a little tired of the same/similar things and could have used a bit more variety. Overall a good choice! 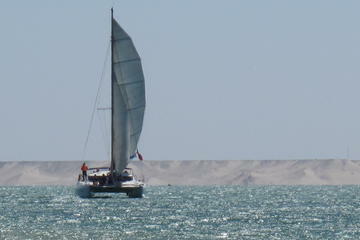 Sail in the Sahara: Enjoy a taste of sailing on a 38ft Catamaran, experience the adventure of getting out on the waters of the beautiful Dakhla bay, feel the power of the wind. Learn some sailing basics, raise the sails, take the helm, or just relax and let the world go by. Check out this company if you’re looking for single day and multi-day tours in the region. They are committed to ecological stability in the area and offer a lot of really interesting tours for anyone visiting. This northern Moroccan beach city is a favorite in summer months. If you can’t make it to Dakhla then consider Asilah instead. Reaching it is easy thanks to the Moroccan national train service and you’ll love all the colorful street art! 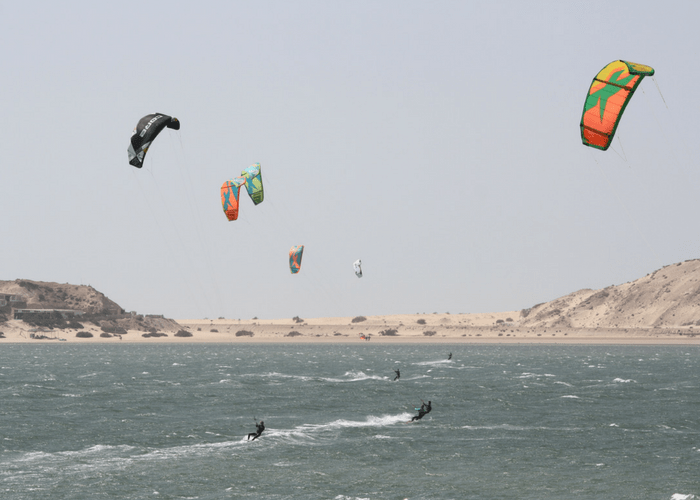 Can’t make it to Dakhla to kitesurf? Then Essaouira might be your next best option. The winds don’t blow quite as hard but it’s a popular spot for wind surfing. There’s also a lot to do in this small, Moroccan city. The city of Agadir is often overlooked as a destination in Morocco, but it is definitely worth a visit. The city has a more modern, resort town sort of feel and is a great place to come to relax and spend time in the sun. The city of Agadir is fairly new on the landscape of Morocco. 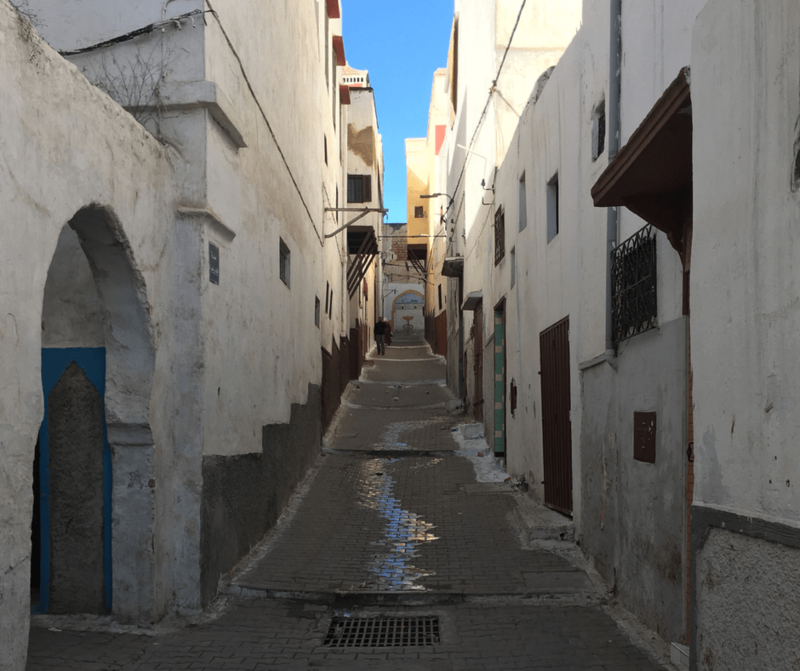 It first started growing as a city in the 1960’s after a major earthquake destroyed the old Kasbah, so it lacks the history of the other, older cities. 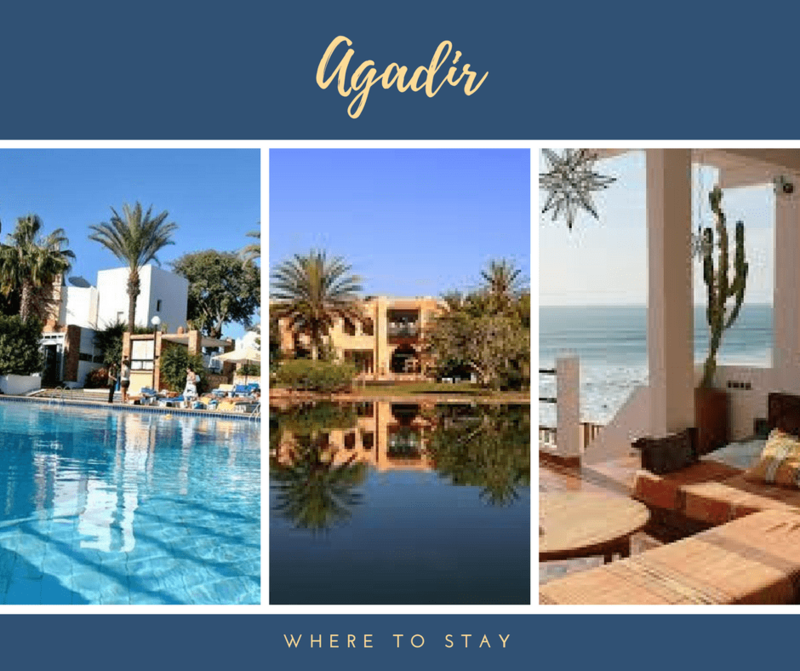 But Agadir is a great place to relax, enjoy great food, and experience different activities than what you would see on a traditional Moroccan vacation itinerary. Agadir is surrounded by many different terrains, making it the perfect place for adventure activities such as surfing along the beautiful beaches, or perhaps hiking through mountain trails. With so many different cultural influences, you’ll find a wide variety of different restaurants and cafes around the Marina and popular areas. French restaurants and cafes line the streets along the beach-front, as well as restaurants specializing in Spanish tapas, Italian dining, and even Asian cuisine such as Chinese, Japanese and sushi restaurants. Agadir feels more like a resort town than other cities around Morocco. The beach front is lined with hotels and you can find boutique shops such as Zara, Mac and Stradivarious within the Marina, a big change from haggling in the souk. Agadir is a friendly and welcoming city and the people are used to tourists from all over the world. It is common to find people who speak many different languages, including English, German, French and Spanish among others, which can make getting around a little easier. Agadir is a laid back, quiet city, with something for everyone, and is a destination any traveller to Morocco should consider. Agadir is located on the southwestern coast of Morocco but is easily accessible. Within Morocco it’s easy to use the bus to reach Agadir. There are connections from major Moroccan cities on Supratour and CTM buses. Marrakech and Casablanca are two popular starting points. This is an affordable option and these bus lines offer comfortable service. Agadir is connected via the Moroccan National Tollway making travel faster than ever. It is possible to rent a car and self drive or hire a driver to bring you to Agadir. Without the same historic culture that can be found in other Moroccan cities, it can be difficult to know what to do if you came to Agadir, as it is definitely not the usual Moroccan experience. But this city has plenty to offer. Agadir Marina is a great place to relax and do some shopping. There are many great shops and cafes, and you can spend your afternoon walking the beachfront and take a look at the works of local artists, shopping in the boutiques without the stress of bargaining in the souk or maybe be a little more adventurous and rent a Sea-doo or boat for the afternoon. Outside of the Marina, there are a couple adventure parks perfect for children and anyone looking for a little excitement. Animal lovers might like the Croco Park, located on the Route National just outside of the city. This park offers an afternoon of seeing and learning about the Nile crocodile. There are 300 crocodiles within the parks treed setting, and visitors will also find picnic areas and cafes. Other parks worth a visit are the go karts at Karting Agadir Circuit located next to the Stadium, as well as the zip lines at Accrobranche Souss which is not far from the beach and is close to the city centre. 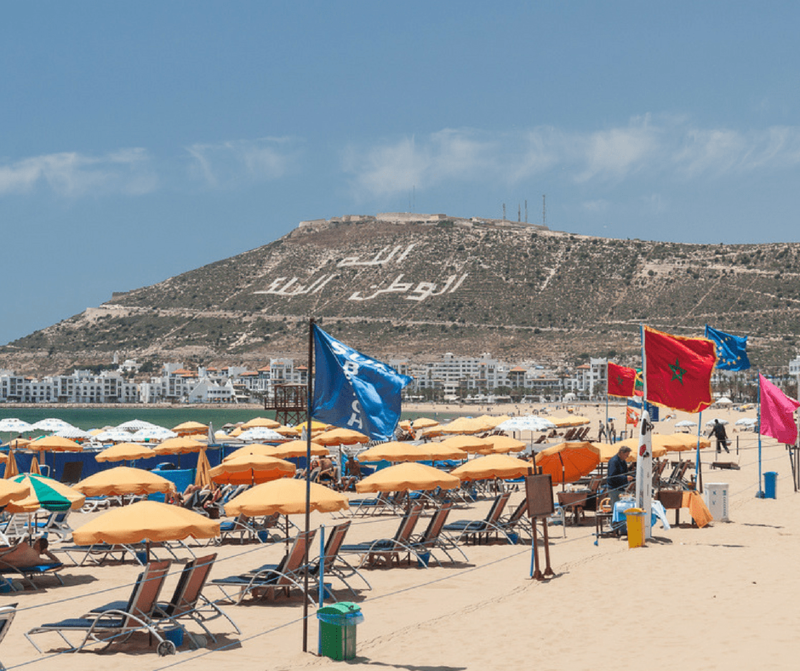 Of course, the Agadir beach is where many people spend time in warmer months and the Corniche is a popular street to walk and enjoy a bite to eat. For those travelers looking for a little more adventure, Paradise Valley in the Tamraght River Valley just outside of Agadir is the perfect destination. Paradise Valley is hidden between the gorgeous mountain ranges and offers visitors the opportunity to experience the beautiful mountain vistas, hike through tree lined mountain paths, bathe in crystal blue spring water, and for those who are brave enough, cliff diving into sparkling natural pools. Paradise Valley is a beautiful natural setting that everyone visiting Agadir should experience. 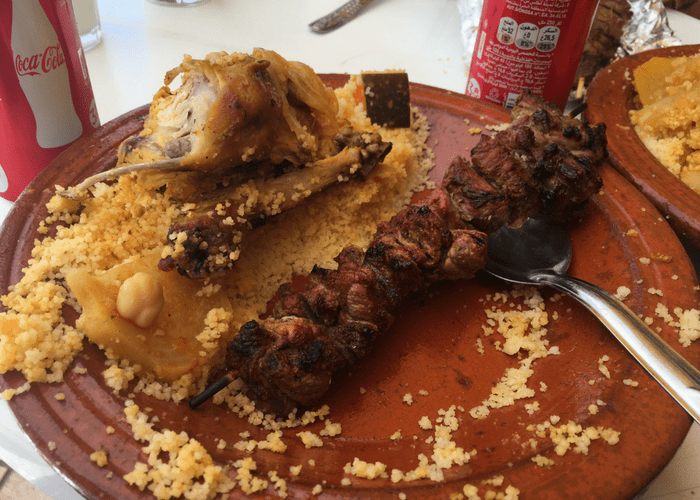 The only problem finding a restaurant in Agadir is deciding what to eat. There are so many different types of cuisine from around the world that it can be a daunting task to choose just where to go. Will it be Spanish paella, or a traditional Moroccan tagine? Hopefully this list can help you make that decision. With a view of the boats in the Marina, Pure Passion is a beautiful setting to have lunch or dinner. The menu is filled with fresh, local ingredients and their desserts are to die for, especially the chocolate lava cake. Pure passion mainly serves French style dishes, but there are plenty of seafood and Mediterranean dishes to choose from as well. This is higher-end restaurant, so if you are looking for fine dining with amazing food, this is a great place to go. If seafood in a more casual setting is more your taste, then try Le Petit Pechure in Galerie Talborjt. 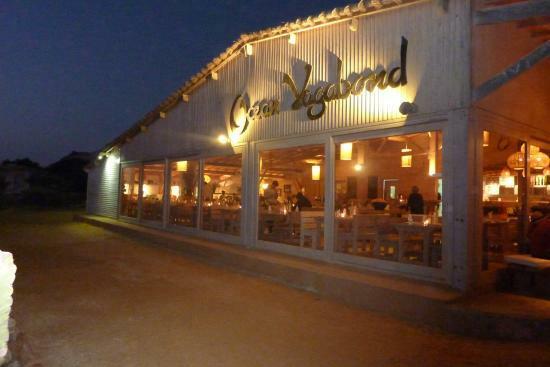 This restaurant serves delicious fresh seafood caught daily and the atmosphere is relaxed and casual. Sit outside in the square surrounded by cafes and boutiques, or retreat inside out of the heat for a wonderful dining experience. On the menu you will find grilled dishes, traditional seafood tagines as well as fish platters, salads and deserts. For a very traditional dining experience the best place is Bab Agadir on Avenue Hassan II. It is a small local restaurant where you will find a quiet atmosphere with delicious, authentic tagines and dishes from the south of Morocco, Middle East and Mediterranean. The service is friendly and the experience is as authentic as it gets. It is definitely worth a visit while staying in Agadir. This is a luxury hotel. This eight floor hotel boasts amenities such as an on-site restaurant, guest gym and spa, pool, as well as a access to the golf course. This hotel is the ultimate relaxation getaway. while taking surfing lessons during the day and yoga classes at night. This mid-range adventure experience is perfect for those who have come to surf some of the best waves in the world, or for those who are interested in learning. It’s a great place and a lot of fun. Agadir is filled with budget and mid-range, family friendly resorts and hotels. This hotel is an all-inclusive option making it a good choice for families who want a laid back holiday. It’s located just 800m from the beach as well as having swimming pools on-site. A sauna, hammam and massage treatments are also available. If you just want to see the highlights of Agadir this might be a good option to consider. It also makes for a good Agadir shore excursion if you’re arriving by ship. This is a small group tour that gives you an overview of the city and its history. If a visit to Paradise Valley is on your list but you’d rather book a tour than go it alone, consider this trip! You’ll not only get a chance to take a hike and enjoy the water pools but lunch is included too. Get the little ones involved with this fun experience just north of Agadir! All equipment and a qualified coach are provided with this experience so that parents can relax and enjoy the beach while kids have a great time learning how to sail. 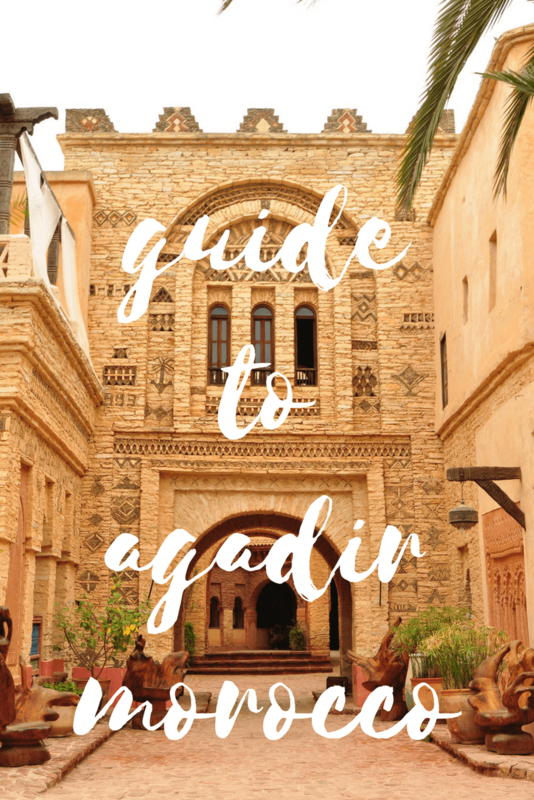 Even though Agadir doesn’t get as much recognition or attention as other major cities across Morocco, I think we can agree that it definitely shouldn’t be left off the list of destinations to visit. With its cosmopolitan culture, southern traditions and diversity, Agadir deserves a top spot on any travelers list. Taroudant is located about one hour from Agadir. It is an inland destination and great for anyone who wants to learn more about argan and see a more traditional Moroccan city. 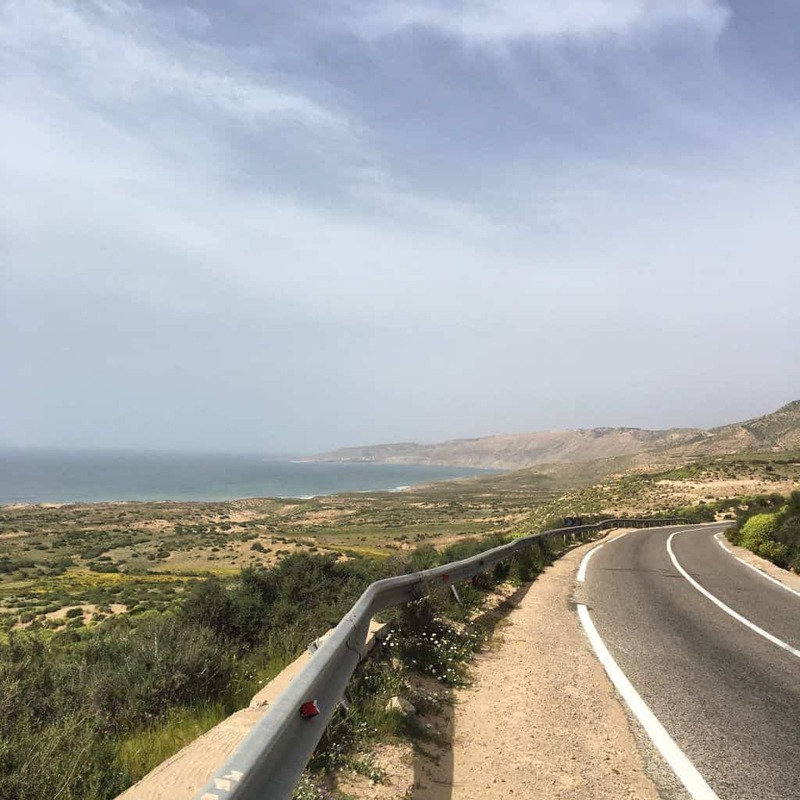 While there is a tollway that connects Agadir to Marrakech and points north, this coastal drive is truly one of the best in Morocco. 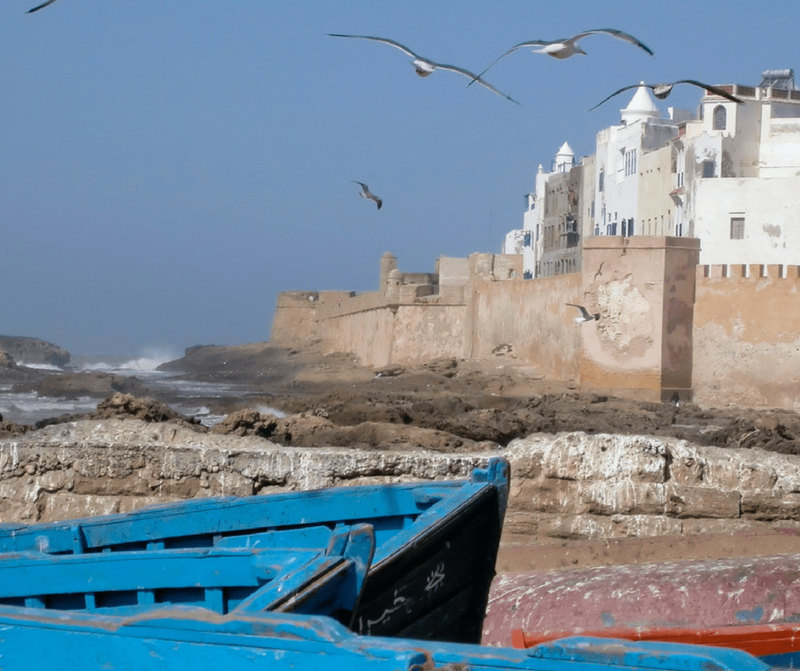 Wind through the country and head north to beautiful Essaouira! This destination guide has been contributed by Lynn Sheppard author of the website maroc-o-phile, a great site to read before visiting Essaouira and surround areas. 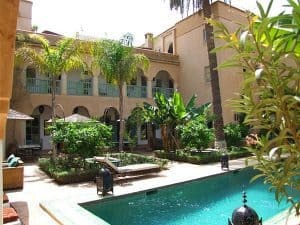 Taroudant doesn’t get a lot of love on the typical Moroccan tourist circuits of the Imperial cities, desert and coast but as a gateway to the Souss and Anti Atlas it is a great base for a couple of nights. If you are interested in hiking or learning about Berber culture, a longer stay or a two centre break combined with Taroudant would allow you to get to know Morocco off the beaten track. Visiting Taroudant as part of an Anti-Atlas circuit including Tafraoute and perhaps Tiznit, or on your way south from the desert to Agadir and the Atlantic Coast. There is enough to see and do in the city for a day or two, but the best thing about Taroudant is its location in the fertile Souss valley and at the foothills of the Anti Atlas mountains, which are teaming with Berber culture including ancient granaries, ages old Koranic schools and lush green agricultural terraces. 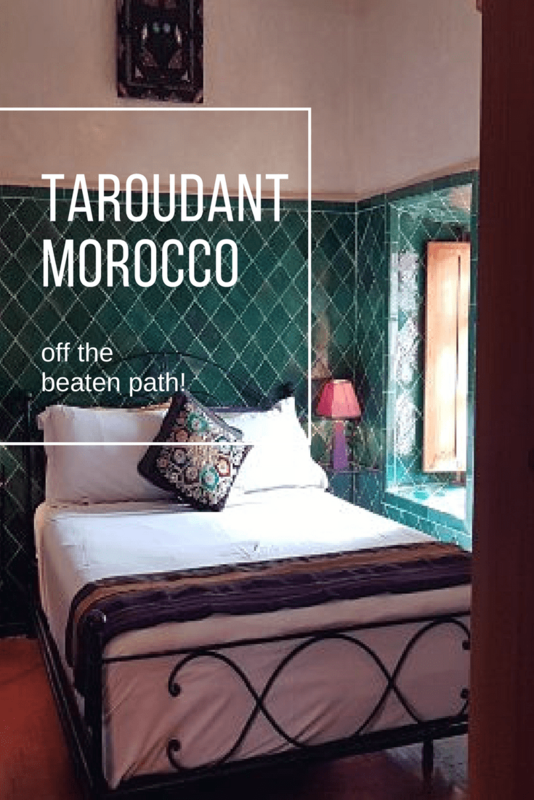 Taroudant is a little too far south to make it a Marrakech day trip but from Agadir this is totally possible. Geographically it’s directly south of Marrakech, and about a 3 hours drive. From Agadir, draw a line directly east to run into Taroudant. The easiest way to get here is via private car or transfer. However there are also regular buses that come to Taroudant. Taroudant is a former capital of Morocco, built by the Saadian dynasty as a base to attack thePortuguese on the Atlantic Coast. The city walls, which are almost completely intact, were built in 1528 and reflect the glow of the setting sun, making them a favourite location for locals to hang out and promenade on summer evenings. The newly opened Palais Claudio Bravo Camus is the former home of Spanish hyperrealist artist, Claudio Bravo, and is fast becoming Taroudant’s worst kept secret. 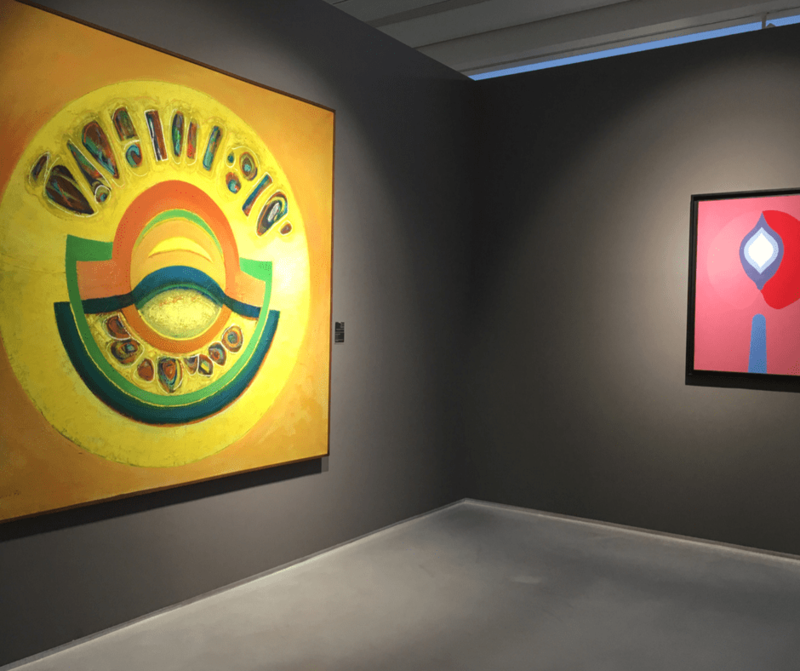 Guided tours of the interior are available, featuring Bravo’s work and multiple collections as well as pieces by his friends such as Picasso. It is free to walk through the grounds and gardens. Tea is served in the summer pavilion overlooking a man-made lake. Inside the walls you will find a bustling Moroccan market town – much less tourism-oriented than Marrakech, which succeeded it as the Saadians’ base. Check out Taroudant’s two souks, either side of the main square, Place Assareg. These are souks for local people, and you won’t find the touristy fare of other cities. In the municipal market (also known as the Berber Souk), you will find all the essentials for a Moroccan household: dried fruits, buckets of vibrant spices, Chinese manufactured plastic items. You will also find men recycling plastic and rubber into useful implements for farmers such as water troughs and saddles. Across the square, the older, so-called Arab market is where you will find local handicrafts such as ceramics, terra cotta metal wares and leather goods. The leather comes from the tanneries, which are just outside Bab Taghrount. If you missed the more famous tanneries in Marrakech or Fez, pop in here for the authentic (and smelly) experience! 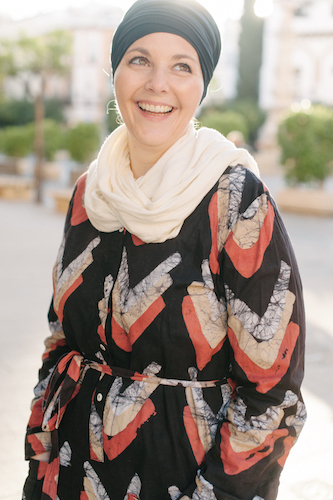 At Riad Maryam, Taroudant’s oldest working riad, you get the very best in Moroccan home cooking, thanks to chef Latifa, who has even featured on a Moroccan cookery programme. The menu features the very best of Moroccan classics such as tajine and couscous and in a country where desserts are usually fresh fruit or cookies, her pastilla du lait is to die for! They can also arrange for you to prepare your meal. When you want a change from tajines and couscous, eat a European influenced menu poolside under citrus trees at Dar Zitoune, a small self-contained resort 2km out of town. For special occasions, order a mechoui (spit-roasted) lamb in advance. 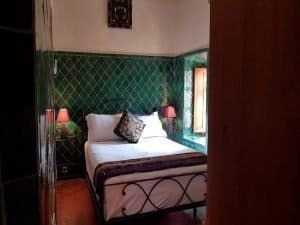 A luxurious boutique riad in the heart of the medina. Hidden behind high walls are a lush garden, pool, gym, bar and restaurant. Book ahead as it often fills up. Slightly out of the centre but close to plentiful on-street parking, Riad Tafilag is a small guest house with a big emphasis on relaxation. With a plunge pool and little corners and niches for chilling out with a book, it’s a good reason to stay longer in Taroudant! 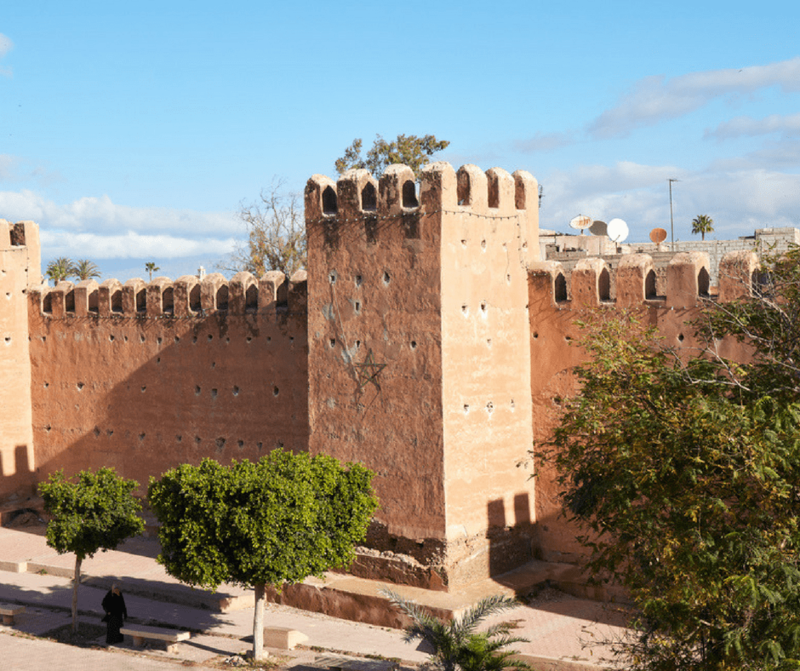 Often over-looked, if you have time to explore Morocco in more depth, a clutch of high spec riads and a laidback medina make Taroudant worth a visit, either as part of a larger circuit or as a base to explore the Souss and Anti-Atlas region. 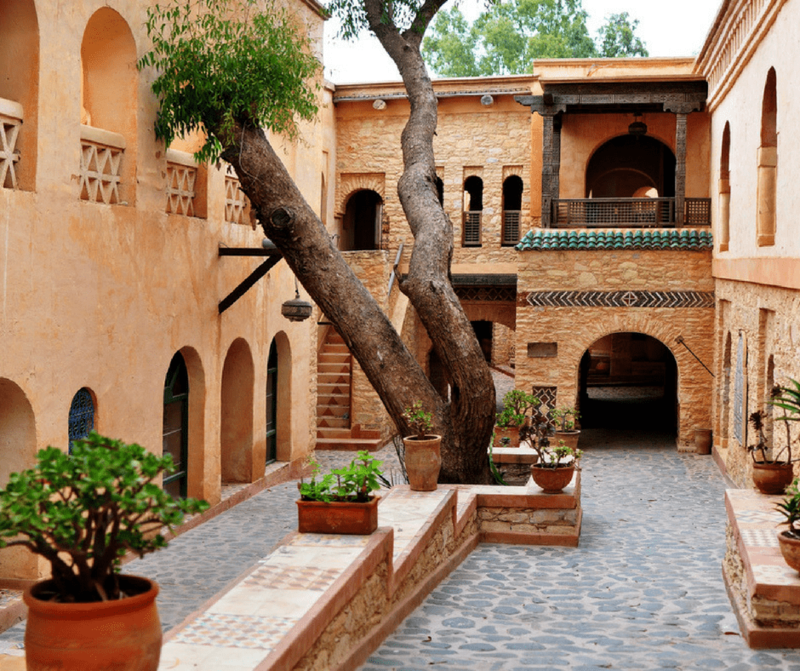 Taroudant is known for leather goods and terracotta. Although a garden pot might not fit in your suitcase, a pair of locally made babouche slippers will surely be appreciated by friends back home. What is the capital of Morocco? Many people believe it’s Casablanca but in fact Rabat is the capital. In 1912 with the beginning of the French protectorate of Morocco the capital was moved from Fez to Rabat. In 1956 when independence was regained it was decided that the capital would stay put. Rabat isn’t on the tourist radar but there are many reasons to include it on your list. We recently went to explore the best of Rabat to help you plan your visit! Morocco’s major airport is in Casablanca however there is a Rabat airport. Most flights that arrive here are either domestic or limited flights from Europe. Chances are you’ll arrive in Rabat from a land entry; train, bus, or car. Which you choose may depend on your budget and how you plan to travel in Morocco. To get from Rabat to Casablanca (or vice versa) the easiest option is likely the train. There are three train stations in Casablanca that can be your starting point to reach Rabat. Casa Oasis, Casa Voyageur, and Casa Port. Casa Oasis is the first train station arrival point if you’re taking the train from Casablanca airport to the city. From here you would change trains, reaching Casa Voyageur as the second station and onward to Rabat. You will want to buy a ticket that takes you to Rabat Ville, the main train station in Rabat. 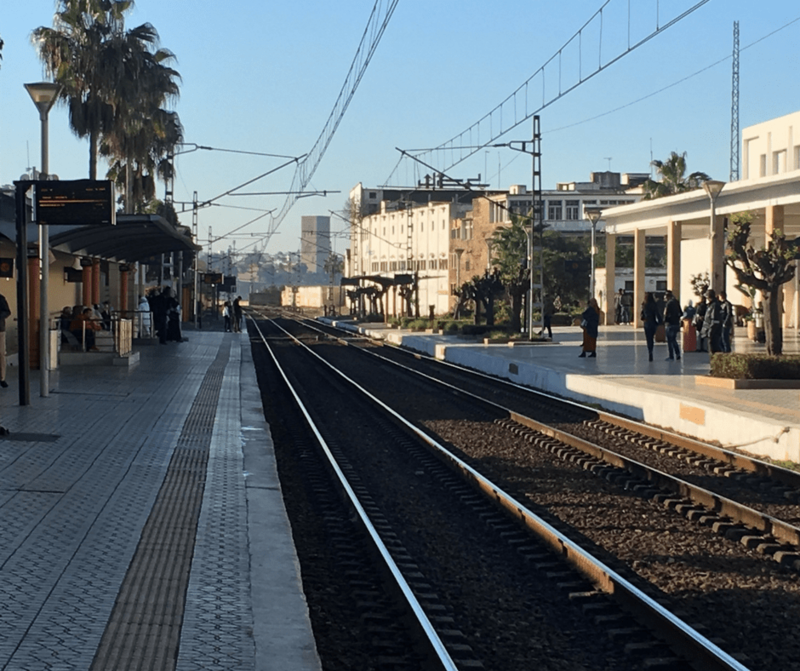 If you are departing from the city of Casablanca head to Casa Port station where there are regular commuter trains to Rabat leaving twice an hour. (Find full time tables on the ONCF website). You can reach Rabat from other cities as well. Simply check the timetable and purchase your ticket to the appropriate station. A second option to reach Rabat is to use the bus system. I recommend Supratours buses as they are reliable, comfortable and have few mechanical issues. Not all cities will have buses to Rabat, as they try to reach places where there is limited train service to give another option. You may need to use the public bus system. These buses depart from the main depot in each city. The schedules can be erratic, and buses overcrowded, however they are very inexpensive. A third option to reach Rabat is by car. You can buy a seat in a shared grand taxi or you can hire a driver to take you privately. 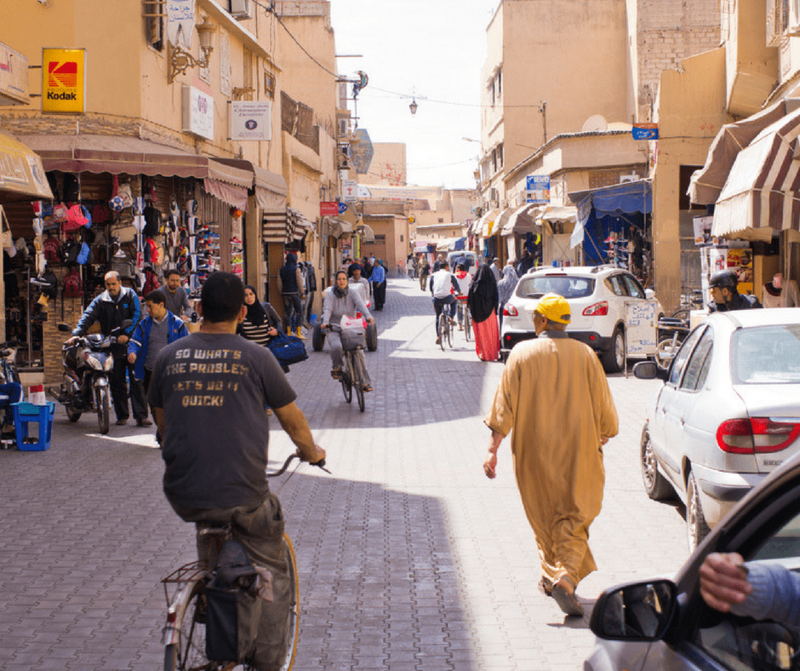 If you would like to navigate the taxi system, take a read of this post on getting around Morocco. Private drivers can be arranged through your accommodation. The usually have direct contact with drivers or taxis that can be hired to take you to your destination. This is often the fastest way to travel however it is also the most expensive. The Rabat tram (Rabat-Sale tramway) makes getting around the city very easy now. The system is not only well maintained, used by a lot of people, but also clean and will get you to almost all the major attractions. There are ticket kiosks at most stops with attendants who speak some level of English and can help. Tickets are reloadable and are 6dh. There are only two lines; Line 1 and Line 2 making it easy to navigate. Service runs every 20 minutes. If you’re staying in nearby Sale, on the other side of the Bou Regreg river or just want to visit you can also take a dhow boat. Before the bridges this was the way to get across. The ride is fairly quick and costs 2.5dh each way. Even if it’s more of an adventure than a transportation option you can pretend you’re a pirate for a little while! Rabat and Sale are two different cities, however over time they have almost become one. Sale lies on the right bank of the Bou Regreg river while Rabat is on the left. Sale was an independent republic and home to the famous Sale Rovers (pirates) until the 17th century when it became part of Morocco. This side of the river is often overlooked and while they may be two different cities, they are historically and now geographically linked. 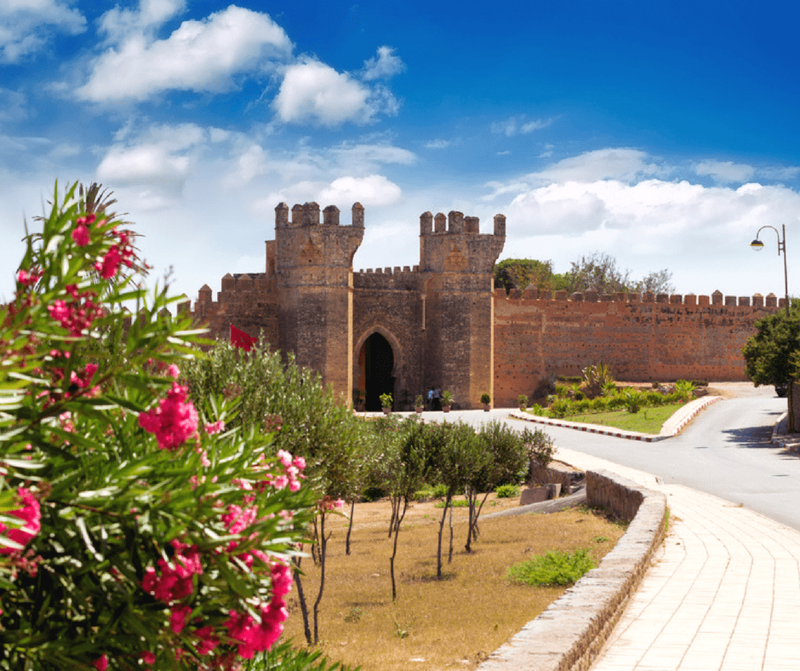 If you’ve decided to visit Rabat then you’re probably wondering what is there to see and do . I wondered the same thing but after our long visit, I realized we hadn’t spent enough time to see it all! I’ve chosen just twelve must see Rabat attractions here to consider but there are many others that I had to leave off for space! The first time Rabat became the capital of Morocco was in the 12th century. Then ruler Yaqub al-Mansour undertook a project to build what would be the largest mosque in the entire world. However, he died before the building was completed and work was abandoned. In 2012 these ruins were granted UNESCO world heritage status. Visitors can easily walk around them today. Nearby is the tomb of Mohamed V, Morocco’s first post-independence king. Hassan II and his brother Prince Abdallah are also entombed here. It is possible to to visit the interior of the mausoleum. Visitors are reminded this is a tomb and solemn place. Outside the city center you will find the Chellah and it is here that early explorers made their base in Morocco. The Phoenicians and Romans were here and the ruins tell this story. Later the Berber rulers the Almohads used the complex as a royal burial ground. A mosque was later added as well as other architectural details of the middle ages. In 1755, the earthquake that shook Lisbon made its impact here as well causing a lot of damage. Today, it’s very easy to visit the ruins and walk around. Every year the Chellah Jazz Festival is held in the ruins which make for a really unique concert event. The medina and kasbah of Rabat are two different areas but connected. 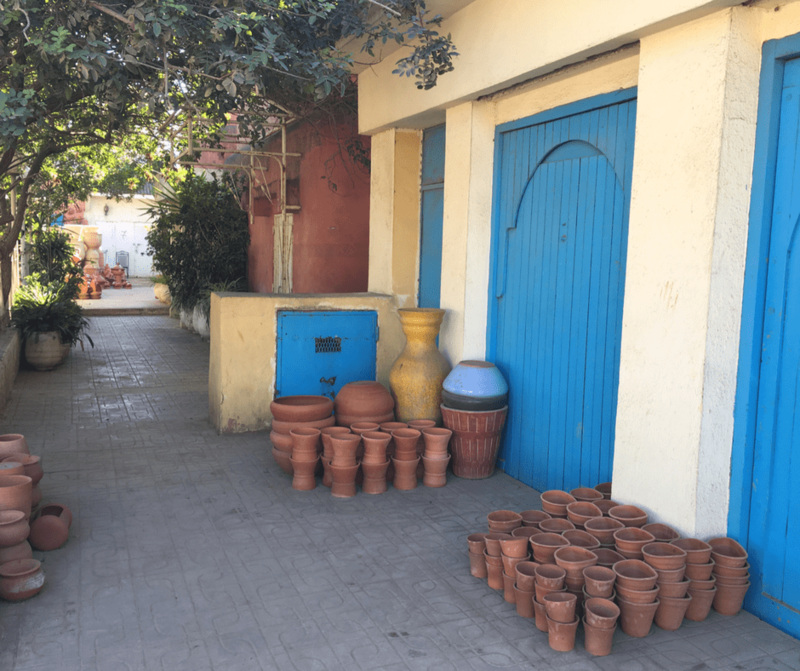 While much of Rabat is extremely modern, home to embassies and important government business, the medina still has reminders of a different kind of life. The medina here isn’t like the medinas of Marrakech or Fez, it’s much smaller and you’ll likely see very few tourists. One special item to consider seeking out is a Rabati rug. The most typical style is a red rug, with a rectangle pattern. The red is inlaid in the middle with a geometric design. There is also a border of another color(s). These rugs look much more like a Turkish or Persian rug than the more abstract rugs of the mountain tribes. 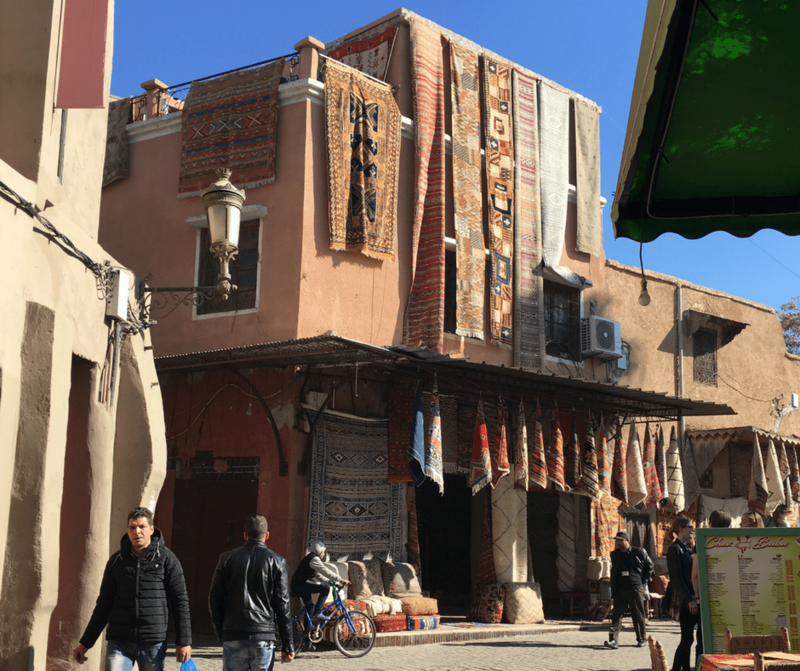 My guide to rug buying in Marrakech, while a different city, may prove useful. 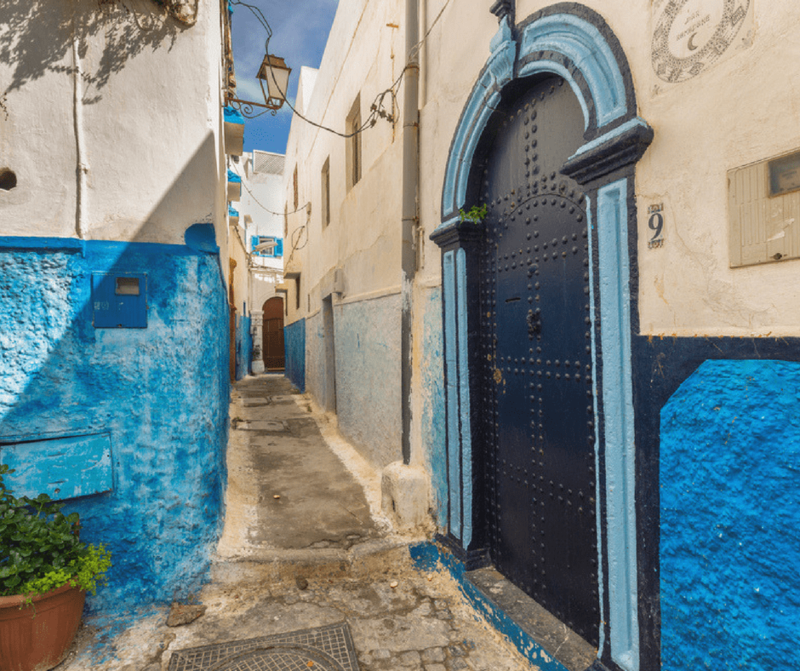 You’ve likely heard of Morocco’s famous blue city at this point (if you haven’t you can in this post), but did you know Rabat has it’s own mini-blue city? The kasbah of the Udayas was built in the 11th century and has been consistently inhabited since then. Wander the streets or sit in one of the cafes on the edge of the walls and watch the ocean stretch out in front of you. You’ll also find Kasbah Mosque (interior access not permitted to non-Muslims), the Andalusian Gardens, and Oudaias Museum in this area all worth a peek. This might not be for everyone but for art lovers or anyone that is seeking out authentic craftsmanship you must visit. This was originally just potters however now there are many different types of workshops in the complex – and it is big! You’ll need a car (taxi) to reach this point even though it’s not far from Rabat and make sure the taxi waits for you because it’s very hard to find any going back. Yes, Rabat is on the Atlantic Ocean and it does have beaches! Temara and Skirat are two popular beach spots. If you’re a surfer and want waves that are a bit more of a challenge Plage des Nations is the place to go. Don’t expect spotless white sand beaches and know that most Moroccans wouldn’t think of touching the water until the warmer months of summer. This is also when the beaches are more well kept and maintained. I have had visiting this museum on my list since the museum opened and was only a little apprehensive as other museums in Morocco are a bit of a let down. Not here. I would say visiting here is a must because it puts a completely different light on Morocco and Moroccan art. The building itself is beautiful and the entire exhibit on par with art museums in the rest of the world. The one downside is that the placards are all in Arabic or French so it may be difficult to get the background of the pieces. They also have rotating visiting exhibits that have include Picasso and Goya most recently. If visiting with children you may want to visit the Rabat zoo. 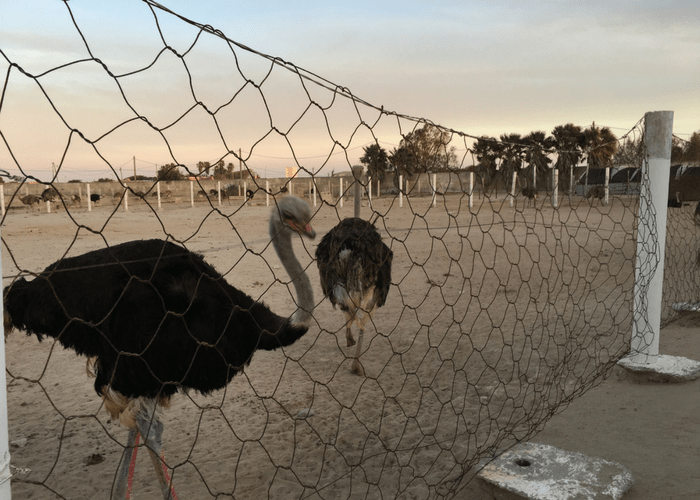 It isn’t as fancy or as well put together as larger zoos throughout the world but it will give you the chance to see animals native to Morocco and the greater African continent. This impressive mosque was built in the 12th century and is the third-largest in Morocco. It has been destroyed and rebuilt many times since its original construction. One of the most recent times was in 1851 when Sale was bombarded by French forces causing great damage to the mosque. Not only was and is it a religious monument but it was a gathering point for the Moroccan nationalist movement in the 1930’s in their plans to remove the French protectorate from power. Non-Muslim visitors are not permitted interior access but can view it externally. This medina isn’t as fancy as Marrakech or even Rabat but it’s a very authentic medina experience. This is a medina of the working class, it’s not glossed up for tourists and most people you’ll see are those going about their daily chores. If you do want to do some shopping you’ll find prices in Sale more reasonable than most cities, even nearby Rabat. I had no idea this even existed until our hosts at Repose Riad pointed it out on a map of Sale. On Avenue Sidi Ben Achir against the city walls are the remains. Rumor is that they are currently undergoing renovations and it’s a bit of a needle in a haystack to find. There is a guardian who will give you a tour if you catch him nearby for about 20 dirham. Every year the government of Morocco hosts Mawazine, a giant music festival bringing some of the biggest names in national and international music to Rabat to preform. Millions of people attend and it is one of the largest music festivals in the world. Mariah Carey, Whitney Houston, Kanye West, and Jennifer Lopez are just a few of the major names that have appeared on Mawazine stages. There are both free and ticketed concerts; the hope in doing this is to provide entertainment to those of all economic backgrounds especially those who wouldn’t be able to afford normal high-priced tickets to such events. When you plan to visit, know there are many options for where to stay. As Rabat is the capital of the country many hotels appeal to business travelers – and this will be reflected in their rates. Smaller hotels and riads are also available and may prove to be a more affordable and authentic way to experience the city. This is our preferred place to stay in Rabat-Sale. The riad is actually in the medina of Sale but with access to taxi’s and the tram that goes to Rabat. From the moment we walked in we felt like family and were treated as such for our entire stay. 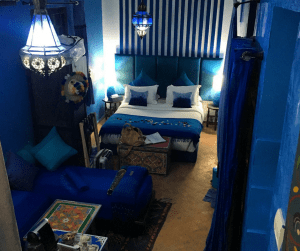 Each room of the riad has a different theme. I also loved that their dinner menu (available at an extra charge) was completely vegetarian – what a nice change! You can request something special ahead of time as well. Breakfast was MORE than filling and they went out of their way to accommodate MarocBaba’s celiac needs. Look to book here first, and then consider other options if they’re full. 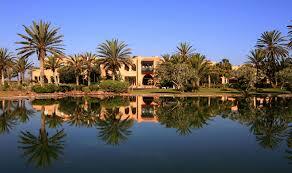 As far as hotels in Rabat go, this is one of the nicest – and most expensive. But, if you’re seeking a luxury stay then you can’t go wrong with this. Near the Royal Palace with more than 17 acres of gardens and 3000 roses the wafting scent of roses will make your stay all that more sweet. 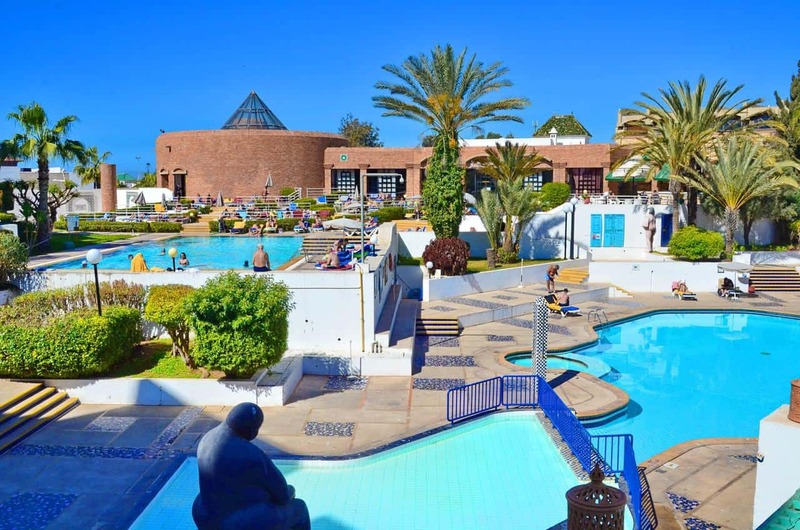 You’ll be within a short distance of Rabat’s major attractions or spend your day lounging by the pool. No roses here, instead Villa Mandarine is surrounded by an orange grove. There are only 31 rooms and 5 suites creating a mix between a riad and boutique hotel. All rooms have their own terrace and all bungalows have their own private gardens so you can have as much or as little contact with other guests as you would like. They also have an excellent restaurant mixing Moroccan ingredients and flavor with French and Mediterranean influences. If you’re in Rabat just make yourself a reservation here first thing. The later you show up the less chance you’ll have of getting in, and you’ll more than likely have a wait for a seat. Not only is it very popular, the food is exceptional. This isn’t Moroccan and you won’t find a tajine on the menu – it’s Syrian and very authentic. There’s really nothing bad you can order but make sure to start off the meal with the mezze, get a mint lemonade, and save room for some of the pastries for dessert. This restaurant may not have the very best food but it’s a unique experience to eat on the boat. If you don’t end up eating here, you can easily just come for a drink or dessert on the ship. For very French cuisine in a nice atmosphere head here. There are several fish and seafood dishes on the menu. The price is on the higher end so be aware. Reservations are a good idea. Also open for lunch. For something a little different try this spot for tapas and Spanish Basque cuisine. The one negative is that they do allow smoking inside so if this is something that bothers you avoid. You should have a reservation ahead especially on the weekends. If you’re looking for local seafood this is a good place to start. It’s on the water and the views add to the meal. Don’t however expect five star refined dishes, instead expect Moroccan dishes. There are non-seafood dishes and the restaurant also serves wine. This spot is recommended by one of my good friends that lives in Rabat. She says this medina spot looks like a coffee shop on the outside but inside you’ll find a great, local menu. 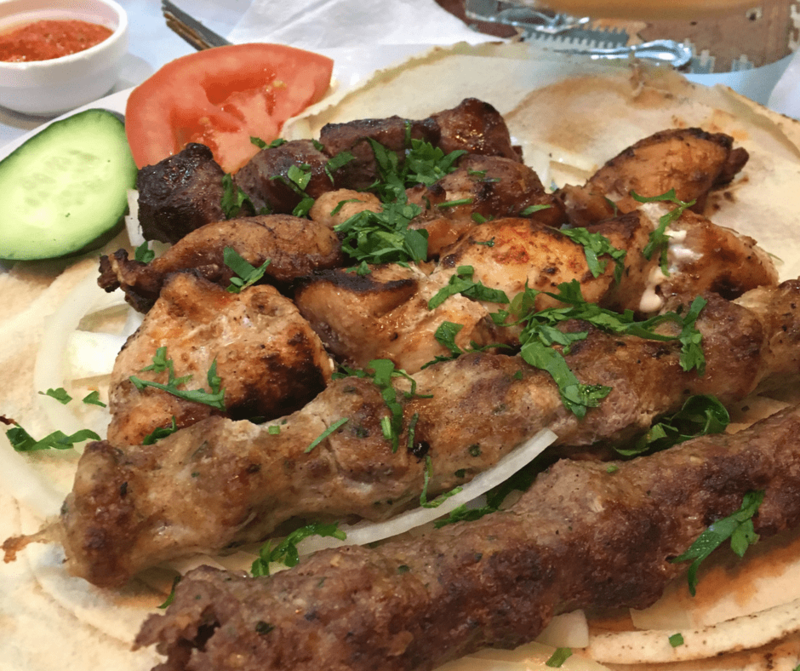 Order the grilled kabobs and briouats. There you have it! I hope that this information helps you plan your visit to include Rabat when you’re in Morocco! Want to know more about Morocco’s Pirate Past? Here are a few books that tell the story of this period. Want to Take This Guide With You? The best way to experience Morocco is through the small towns and villages that lie between the larger, well known cities. The town of Imouzzer du Kandar is one such town that anyone visiting Fes should definitely make the time to visit. Situated between Fes and Ifrane, the sleepy little town offers more than you might expect. Built by the French during the protectorate era in the early 20th century, many of the buildings reflect French architecture more so than other parts of the country. Many of the buildings are stone with slanted roofs typical of what you would find in neighboring Ifrane. The area is covered in cedar trees, and the locals enjoy one of the largest fresh water sources in the country. The star of the city, and the feature that gives this lovely town its name, is the beautiful waterfall at the edge of the town. People come from all over to see the natural beauty of the area, as well as to find relief from the heat of Fes and Sefrou. Its cooler climate makes it a popular destination for Moroccans to vacation in. Popular attractions in Imouzzer for foreign visitors include some of the old buildings, such as the old church, which was one of the first things build in the area, now a museum showcasing the history of the area and the people. There is also the old medina where visitors can find the hammam, the market and many local restaurants serving authentic Moroccan food. The weekly market happens on Monday. There you will find many vendors coming from all over selling a wide range of things, from fruits and vegetables to clothes to electronics and housewares. The town is full of parks and pools where people like to picnic in the afternoons, and in the evening the streets come alive with people and families out enjoying the cool night air. Vendors come out selling small toys and snacks, and cafes fill up with people who have come to socialize over espressos and Moroccan mint tea. Some of the best harcha and meloui (similar to m’semmen) in the country comes from this little city. If you do stop by and visit stop at any of the little storefronts with women at the griddle making these bread treats. In the rural area just outside the city center there is a great cheese farm that makes for a lovely visit and tasting. Reservations should be made ahead. 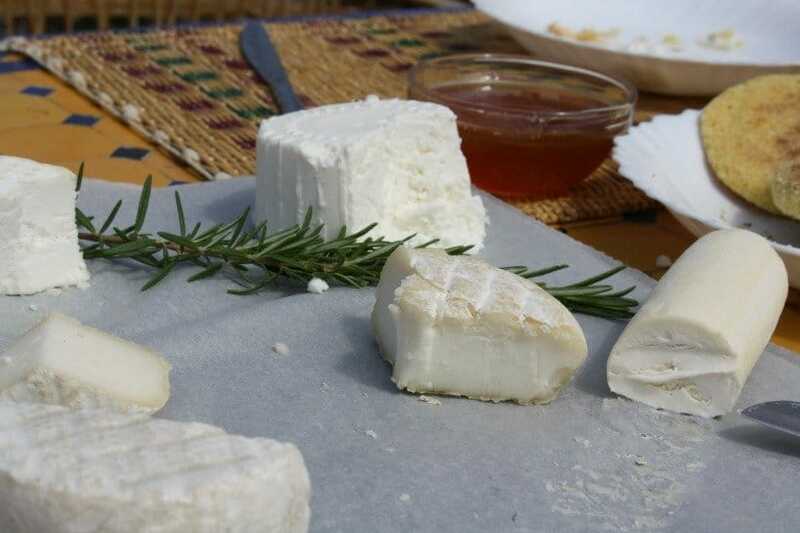 If you’re interested in visiting be sure to read this post on cheese tasting in Immouzer. 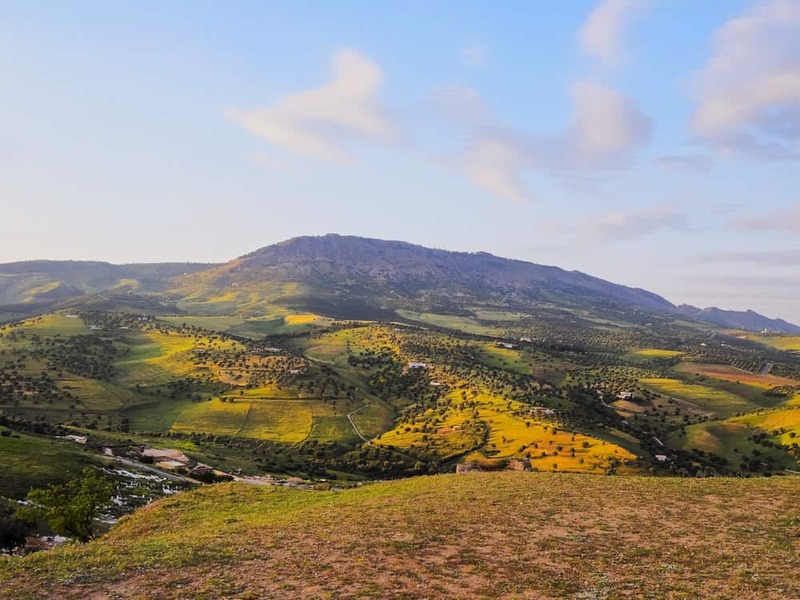 This area is well known for producing apples, so you will find the surrounding area dotted with many apple orchards, while on the road between Imouzzer and Ifrane you can stop at roadside stands selling everything from fruit and honey to geodes and pottery. 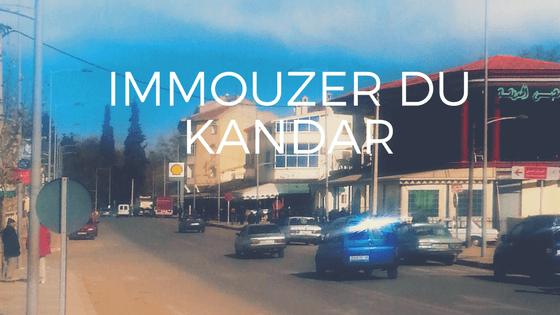 There is 26 km between Imouzzer and Ifrane and the drive is beautiful. Mountains and lakes make up the landscape between these two towns so it is well advised to bring a camera for the short trip. If you’re driving your own vehicle you can easily stop along the road and enjoy the natural beauty. The best time to visit Imouzzer is in the spring or early summer. Visit later in the season and you may find the waterfall dried up in the summer heat, however there are other attractions if you plan on being in the area in the later summer or autumn months. Imouzzer, like Ifrane gets cold in the winter and can even experience snow, so if you plan on visiting during this time, make sure to bring some warm clothes. As for traveling, there is no train passing through, but there are many options to get there including the bus and the infamous Grand Taxi. But if possible, it is always better to have your own vehicle. The people of Imouzzer are friendly and love the opportunity to share their culture with foreign visitors. You are certain to have a wonderfully authentic Moroccan experience when traveling to or through this hidden gem of a town. There are many nice hotels located in Imouzzer for travelers to rest. Whether staying to enjoy the area for a couple of days or just passing through, the hotels are a clean and comfortable place to stay while visiting. Close to the city square are the Hotel Royal and Charhazad. Both mid-priced hotels which offer close proximity to the city centre, restaurants and nightclubs. While 5 km outside of the town visitors will find Dar Daifa, an auberge offering views of the surrounding natural beauty. Gita Karine is another option that includes a swimming pool and is a good option for families. You also can spend the night in nearby Ifrane as there are limited options in Imouzzer. Michlifen is one of the nicest hotels in the area and is a true luxury experience. Residence Ifrane Palace is a more affordable option for anyone wanting to spend the night. Bananas and surfing are the main attractions in the small villages dotting the coast between Agadir and Essaouira. For decades people have travelled to these beaches to experience some of the best surfing spots in the world. In my opinion, this is one of the most beautiful drives in Morocco and well worth the journey! If you are traveling along this stretch of coast, there are a couple of places that you should definitely stop in and explore along the way. 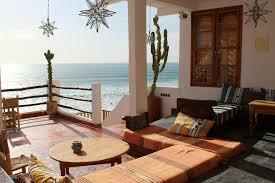 Taghazout is a small, laid back surfing village north of the main city of Agadir. The calm, quiet atmosphere plays host to surfers, both expert and beginner, who want to ride some of the best surfing waves in the world. 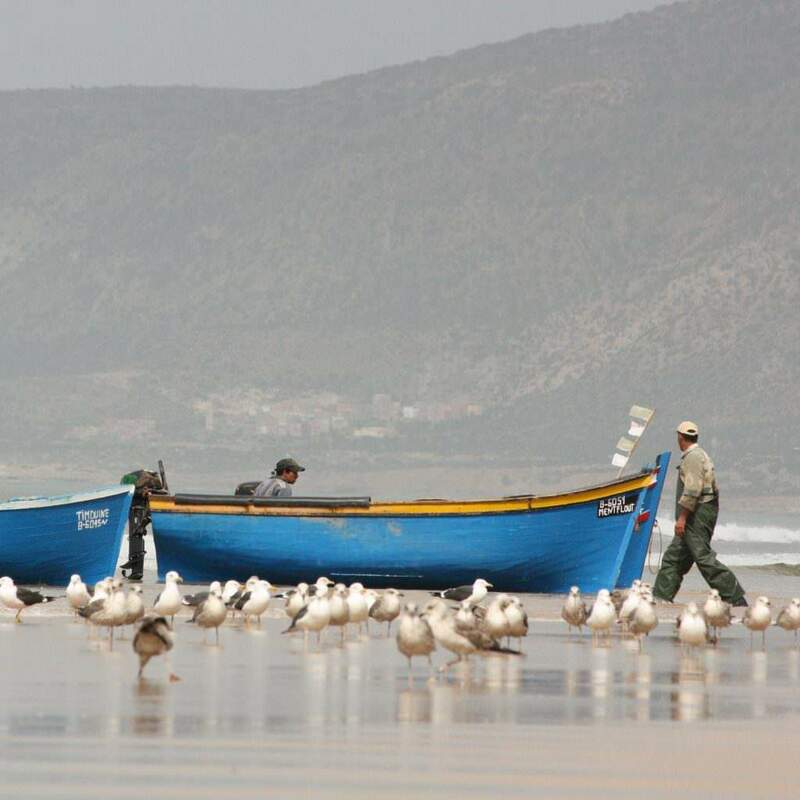 Taghazout is also home to a community of fishermen. The small blue fishing boats can be seen in the early morning out in the sea making the days catch. In the afternoon they line the beach being repaired, and waiting to set sail once again. You will also find some of the freshest seafood in these coastal villages, and Taghazout has been home to some of the best restaurants to get authentic, Moroccan seafood dishes. The old village is getting a facelift. Surfers and tourists keep coming and the aging village has had to make improvements to keep up with the demand. There are many new accommodations available and the construction continues with new attractions and accommodations being developed for tourists to enjoy. Within the village itself, is where you will find the most laid back and authentic experiences. Stay in a surf hostel, take surfing lessons at the surf school, and spend the evenings enjoying the culture and the food. Just south of the village, the more adventurous traveler will enjoy quad biking, and for a slower, more relaxing sport, visit the Golf Taghazout golf club. Here you will also find the 5 star, Hyatt hotel tucked in the hills with amazing ocean views. 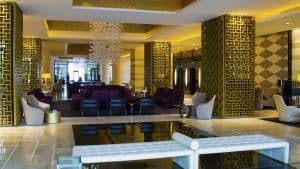 Hyatt Place Taghazout Bay – For the most luxury hotel in the area Hyatt Place is one of the best options to consider. Paradis Plage – This is our favorite place to stay in the area. They offer great accommodation as well as private and group surf lessons for adults and kids. Onsite restaurants, wellness, and a full spa as well a kids club round out the offerings. Taghazout Hotels – find more in your budget and amenity range by clicking the link. Further up the coast is the small village of Tamri. Best known for its lush organic Banana plantations as well as being a quieter but no less perfect surfing spot. The village itself sits about a meter below sea level, giving it a calm and peaceful atmosphere away from the winds and turbulence that is often created by the sea. The village is small but travelers will enjoy the local markets and restaurants. To the south is where you will find a large national park where bird watchers and nature buffs can spend hours examining the many species of birds and plants that are found in this area. For those interested in witnessing for themselves the famous tree goats, there is a viewing post on the edge of the village where you can take pictures of the goats as they climb the argan trees to eat the fruits. Tamri is a small village and is best experienced as a day trip, but it is home to a couple of small hotels. For those who want to spend some extra time surfing or exploring the national park, there are a few options for accommodation. To the north of Tamri you’ll find Camping Imsouane, A camping ground complete with electricity that claims to have been home to Jimmy Hendrix in the 1960’s. Within the village is Auberge Imazighen which offers a variety of room options from single rooms for one traveller to adjoining rooms for larger groups, and views overlooking the lush banana groves. Within the hotel is a restaurant well known for their local dishes. Whether staying the night or passing through, make sure to stop in and taste the delicious tagines and seafood dishes on offer. Tamri House and Dar Banana are two other spots to stay in this area. This is a small village, not surprisingly known for surfing and fishing – as most villages on this stretch are. If you’re into surfing than this is the place you should go. It’s slightly less crowded than Taghazout and the surf is considered really good – and it has some of the longest surf swells in the country. Of course there’s plenty of beach to relax on and take a swim in the ocean as well! There’s also a market hall selling the daily catch. For seafood lovers this is a must. You will be able to purchase fish, really affordable I might add, that has been just caught. Outside the hall there are grills set up and everything can be prepared for you on the spot. Even if you decide not to eat, take a walk through this interesting spot. Getting here is a little tricky. You’ll need to get off the main road and head down the peninsula to reach the village but it’s not too difficult. Having your own car is ideal but public transportation is also an option. You can take any bus heading to Agadir and get off at Tamanar and from here take a grand taxi the rest of the way. It’s possible to take a grand taxi directly from Essaouira, Taghazout or Agadir – they just might be more difficult to hire as a shared ride, though a private transfer is easy to arrange. 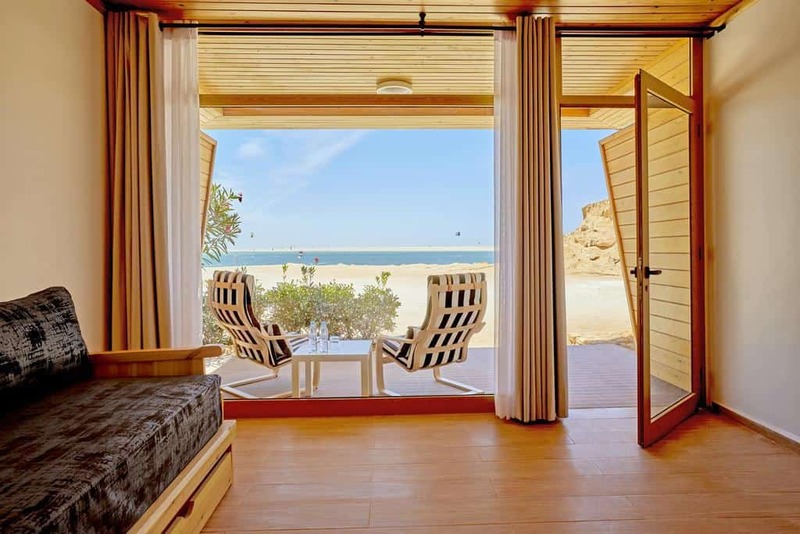 Imessouane Surf Lodge – For a more resort experience, this is where to book. They offer surfing, diving and fishing as well as a restaurant onsite. BoardXhouse – This apartment rental is just minutes from the beach. It’s clean and has a kitchen so you can prepare your own dishes! Auberge Dar Naima – For those on a budget this auberge offers accommodations close to the beach with a variety of different room configurations available. 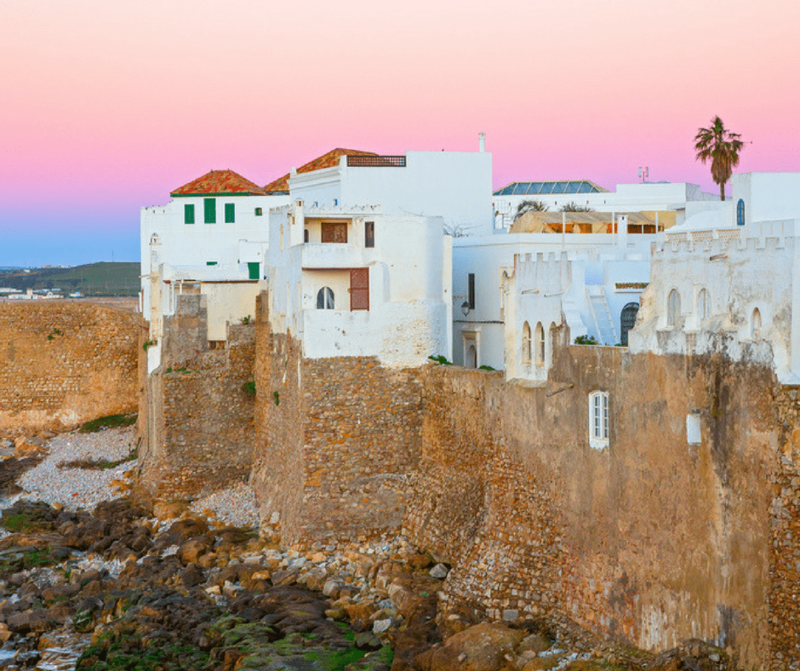 If Essaouira was once a sleepy hideaway, Sidi Kaouki might be what it once was. It’s just 17 kilometers to the south and the name comes from a marabout, a type of hermetic holy man. On first glance it may seem like a village lost to time but today, surfers and people seeking a quieter destination than Essaouira come here. While some people stay here and visit Essaouira without our own vehicle this can be a bit cumbersome. Instead I’d suggest pulling up and spending a few days here. You can take the local bus from Essaouira near the Bab Doukkala gate. Check for (approximate) times. Blue Kaouki – Just 50m from the beach, Blue Kaouki is set up to accommodate surfers. Rooms are affordable and they have a beautiful roof terrace to watch the sunrise or set. Rebali Riads – There are five properties each well cared for and relaxing. Food is on offer and guests are consulted ahead of time to make sure it meets their needs. A good choice! 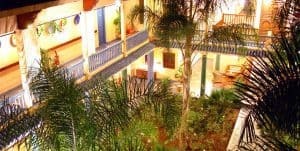 Sidi Kaouki Beach Hostel – Travelers on a budget, try this hostel. Surfing equipment can be arranged. Rate doesn’t include meals but this also can be arranged. Auberge de la Plage – A great value a short walk from the beach with breakfast included. It makes a great spot for couples or families wanting to get away in the village. 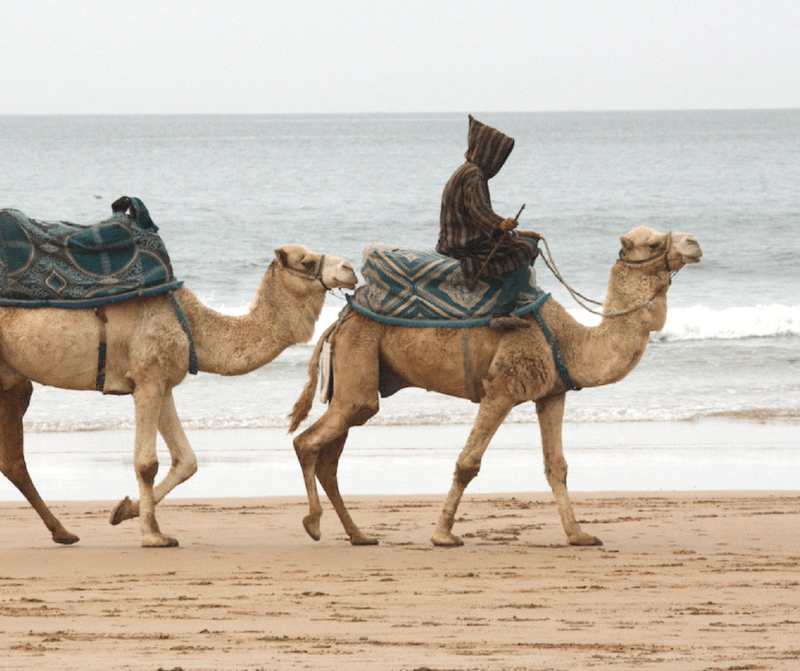 There are a few transportation options along the coast between Agadir and Essaouira. As always the best way to go is having the freedom of your own vehicle, but if that isn’t an option you can take the #33 city bus for around 10 dirham, it will stop along the way in each town with the final stop in Tamri. Another option is the intercity buses, which will make a more direct journey with fewer stops along the way. Finally the famous Grand Taxi, where you can either hire the entire car for the journey, or pay just for one place. For more general advice on getting around in Morocco check out our guide to transportation in Morocco. Wondering what to wear? Check out my general advice as well as what to wear to the beach in Morocco. No matter how you go, make sure to take advantage of the relaxed atmosphere, the amazing food and experiences. This unique stretch of coast certainly offers something unique for every traveller.